The Best Group and Private Photography Tours of the Palouse. Capture amazing rolling hills of wheat, yellow flowering canola, pea and lentil fields all year long. Spring Sunset in the Palouse with Mustard Seed in Bloom! Since 2010 Teri Lou has been leading Palouse Photography Tours for groups and individuals from all over the world. Her passion for this region shines through as she shares classic locations and her rarely visited treasures several times throughout each year. Since the regions vast road system is often overwhelming for first time visitors, a group tour is the perfect solution.Teri Lou allows photographers to sit back and enjoy without having to worry about where to go for the best light at the right time. Group size is limited to only 10. Each tour will start early in the morning before sunrise to capture the golden dawn and end after a spectacular sunset. As we carpool throughout the region making stops at best photographic locations I will share stories and educate participants on the history of the region. Since many days start at 4:30am and end at 9:00pm there is an afternoon break for naps, meals, processing and a photo sharing presentation. Basic camera techniques from exposure, focal points, depth the field will be available. Creative Compositions demonstrations while on location. Lessons on how to shoot HDR images, when to capture 3, 5 or 7 shots will be explained. How to improve mobile photography with "Tricks to Professional iPhone Captures." and "Creatively Process iPhone Captures." will be taught by Teri Lou during a 4 hour afternoon session. The May tour never disappoints, providing endless opportunities to capture so many shades of green among the rolling hills. Among those hills the landscape is dotted with family farms, some abandoned years ago. Together we will follow the perfect routes to capture red and weathered barns in the best light. Throughout the day as the light changes we will find treasured rusty trucks and majestic lone trees. The day will end capturing the shadows as they dance across the uninterrupted landscape. This tour was scheduled during the New Moon phase to provide the option to learn Light Painting techniques and the best settings to capture the Milky Way. Two nights are scheduled for night photography instruction. Join me for 5 days of touring, you fall more in love with the region as we round each bend. June 1-5 - Shades of Green for the iPhone! iPhones ONLY with 2 days of creative editing instruction. For the first time I am offering an iPhone only tour, combining my two loves - The Palouse and iPhone photography. Come discover why I have travelled the world exclusively taking photos with my iPhone, an amazing camera, darkroom and social network that fits in my pocket. An intro to iPhone photography will be offered the morning of June 1st from 9am - 1pm as a great kick off for beginners - attendance is optional. During the tour we will concentrate on locations that work best for the iPhone's 28mm lens. There will be in the field discussions on choosing different camera apps, how to best compose a scene and pre visualizing for processing. Two afternoons will be set aside for an iPhone instruction on editing apps, workflows and cloud storage options. 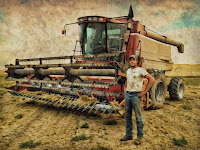 Harvest is a time when farmers, hired hands and seasonal truck drivers are in full swing. This season provides photographers the opportunity to capture amazing patterns in the fields, dust billowing behind combines, and up close and personal vantage points during farm visits. The farmers have a large variety of equipment to bring their golden crops of wheat, barley, peas, lentil and garbs to market. 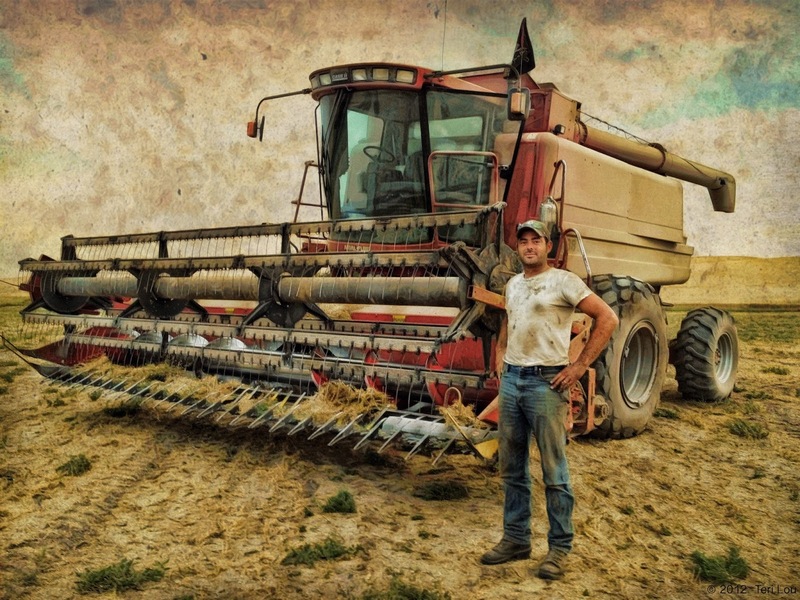 During this tour we will photograph the entire process in the fields, while riding in combines and tractors, and at visits to the storage silos and grain elevators. Along with the farm visits we will capture many other 'Palouse Treasures' along the way taking advantage of the changing light and cloud formations throughout the day. The first day starts at 2:00pm with an introductions and the presentation "My Heart Sings in the Palouse" highlighting the regions amazing photographic opportunities that lie ahead. That evening we continue to get acquainted during a group dinner at a local restaurant, wrapping up the day shooting sunset at a favorite location. For the next three days we will start early in the morning sometimes before sunrise to capture the golden dawn and end after capturing a spectacular sunset. Since many days start at 4:30am and end at 9:30pm there is an afternoon break for naps, meals, processing and a photo sharing presentation. During one or more afternoons an optional iPhone/iPad course: Tricks to Professional iPhone Captures and Creatively Editing with the iPad will be offered by Teri Lou. On the last day we arise early to capture a local favorite sunrise location and then sneak in a couple more barns and fields before returning at the hotel about 9am giving plenty of time for breakfast, packing and goodbyes. The cost of each tour is $1075 per person, a deposit of $300 per person is required to hold your spot. The deposit is 100% refundable 90+ days prior to the tours start date with a written cancellation request, less than 90 days the deposit is non-refundable. The final payment is due in full 60 days prior to the start date. If full payment is not received 30 days prior to start date the participant's reservation will be cancelled and no refund will be given. The Palouse region is located in beautiful Eastern Washington. Arriving by Air - Most participants fly into Spokane International Airport (GEG), rent a car and drive about one hour south to Colfax. An airport is also located in Pullman, WA (PUW). Discounted rooms are available at the Best Western Wheatland in Colfax, WA The room rate in May and June is $105.99. The hotel serves a simple breakfast, has free Internet available throughout, a swimming pool and hot tub and has fresh baked cookies and tea available in the afternoon. Both King and 2 Queen rooms have been reserved. When making reservations call 509-397-0397 mention Teri Lou PhotoTour to access the group block and discount. The Palouse region is full of family run cafes, taverns and corner grocery stores. There are a few fast food options too. For breakfast we will take advantage of the free hotel breakfast most mornings. Lunch will range from a Subway sandwich picnic to a round table discussion at a local cafe. Dinners locations will be decided based on the sunset shoot location. Please plan on packing water and a snack as we tour about because afternoons can be quite warm. There will be cool mornings and warm days so plan on dressing in layers: coat, warm long sleeve top and short sleeve top. Long johns, a hat and gloves are nice to have on crisp mornings. I highly recommend always wearing long pants and sturdy shoes (hiking boots) so you will have access to areas with possible rusty bolts on floors or wire laying hidden in the glass. A rain coat is always nice to have on hand for possible rain showers. The physical activity required is very little. At most locations a variety of images can be captured within a few hundred feet of the car. However optional opportunities to walk further will be offered at some locations. During the farm visit, participants will be able to walk through harvested fields that are quite uneven and short treks to the tops of hills for scenic views will be offered. For those not wanting to venture out into the fields, many roadside opportunities will be available. Once your payment is received I will send you a welcome letter with all the information you will need to prepare for this incredible adventure that you will remember for the rest of your life! This tour may include activities, which may be strenuous, dangerous, or otherwise carry the risk of injury, death, or property damage. While this tour description is deemed reliable, it is not guaranteed complete by TERI LOU DANTZLER. When you choose to sign up, you agree that TERI LOU DANTZLER and her affiliates are not responsible for any inaccurate or incomplete information in this description. Also you assume all risks incidental to the tour for which an opening is booked, whether before, during or after the workshop. Further, you hereby waive any claims for personal injury, death, or property damage against TERI LOU DANTZLER and her affiliates on behalf of yourself and any accompanying minor for this event. Sign up for Tours NOW! With Teri Lou I got more than I could have ever hoped for. She is not just a guide who brings in tours once a year but comes many times a year and has done so for a lot longer than the Palouse has been the "latest photographer’s dream area" to shoot. And Teri Lou does not just come to the Palouse. She immerses herself into the area and the people in it. I learned about the land, farming and believe it or not a ton about iPhone photography. Watch me step up my game there too. We were even able to sit down and have dinner with her good friend Rod (a farmer in the Palouse) and I was given the great luxury to meet one of the most decent, open and humble men I have ever met. Teri Lou Dantzler, a passionate photographer with a vast knowledge of the Palouse region will be leading this photographic tour. "I fell in love with the Palouse in 2002 during my first photographic tour. Ever since I have returned multiple times each year, once spending the entire summer driving all the back roads to find the hidden, out of the way photographic opportunities. I have had the pleasure of meeting several farming families; many with a long history in the region. The Palouse is full of people who take pride in working hard, are self-sufficient and still hang their clothes out to dry on the line. We will have an opportunity to visit one of these farms and hopefully have an opportunity to ride in a combine during harvest." The Palouse offers dramatic photographic opportunities in every season. Therefore, Teri Lou offers private tours for individuals and groups throughout the year. Each Tour is individualized. If you would like to capture red barns all day Teri Lou can guide you to them. If sweeping landscapes are your desire she has several options to chose from. If you want to pack the day with Teri Lou's Best Picks she will be happy to guide you to them. For as little as $500 per day Teri Lou will create a personalize schedule just for you from sunrise to sunset. Photography Clubs from all over the USA have hired Teri Lou to tour them through the Palouse. Each tour is different depending on the desires of the group. Rates vary depending on group size and number of tour days. Contact Teri Lou at teri@terilou.com for more information. Photo Tours are limited to 12 participants who will be guided throughout the region from before sunrise to just after sunset. We will be photographing contrasting rolling hills of farmland, barns in a variety of colors and conditions, working combines, tractors and equipment and abandoned houses and farms that were left long ago. Even though June and August are the most popular times to visit the Palouse we will see very few people amongst its 2100 sq miles. Teri Lou loves to share her knowledge of the Palouse from the perspective of the farmer. Over the years she has made it a point to 'stop in and chat for awhile' with many different families in the area. Her endless desire to ask questions about the crops, the machinery, the history and even the weeds provides participants on her tour a personal look into the culture of the Palouse region. During the Harvest Photography Tour in August, her good friend Rod and his dog Maddie, poses for photos, answers your endless questions and even allows you to ride in the combine as it is harvesting this year's wheat crop. copyright by Teri Lou. All rights reserved.. Awesome Inc. theme. Powered by Blogger.